The Chemical Guys Bug & Tar Remover Car Wash is the perfect formula to help you quickly and effectively remove all kinds of stubborn surface build ups including bugs, tar, sap, bird droppings, brake dust, pollutants, oils, road grime, etc. It is also sometimes known as "Strong Wash" or "Chemical Guys Bug Bugger and Tar Remover" because of how effective it is to use during the washing process. Begin by putting three cap fulls or less of product in your wash bucket with every one gallon of water. Soak your wash media in the bucket and start washing top down and you should be able to loosen and remove the bugs, tar and other stubborn contaminants safely and easily. Rinse the vehicle thoroughly upon completion to ensure it's clean. For problem areas you can go back and use the product directly on the surface with your wash mitt or sponge but we recommend you dilute the formula at least ten to one and rinse it thoroughly after you are done. Use this formula on a cool surface in the shade, if it's warm or if there is any sun exposure make sure you rinse frequently. When you are all done you'll notice your paint feels incredibly clean and looks fantastic again! This product does not come with a trigger, but the DI Accessories Adjustable Trigger works great if you desire to spray the solution onto the surface. Bug & Tar Remover is a heavy-duty cleaner designed to safely break down and wash bugs and tar away from any vehicle. The concentrated formula removes stubborn stuck-on dried bugs and tar residue. Bug & Tar Remover is safe on bumpers, windshields, headlights, plastics, chrome and painted surfaces. Simply spray Bug & Tar Remover on the surface and gently wipe away nasty bugs with a microfiber towel. Add Bug & Tar Remover to your wash bucket to remove dried bugs and grime with the premium Chemical Guys Bug Sponge. Bug & Tar Remover is clear coat safe and removes heavy bugs without damaging paintwork. The versatile formula breaks down grease, tar, dried bugs, road film, insects, and body panels. 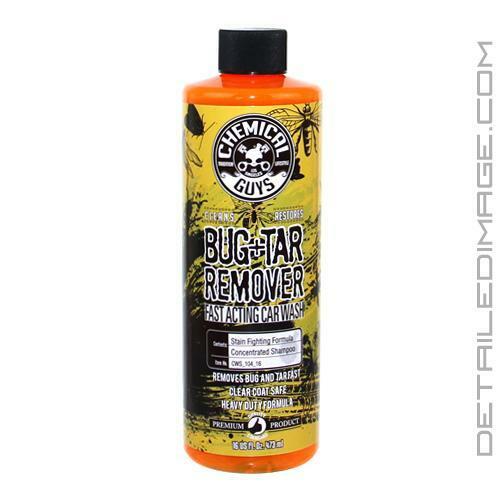 Bug & Tar Remover is fast-acting and reduces the amount of scrubbing needed to remove bugs and grime. Wash away bugs, tar and grime with Chemical Guys Bug & Tar Remover. This product does the job. Works really well on bugs.I didn't really have much tar on my vehicle. I used it primarily to remove bird droppings. It worked pretty well on that, but still took a bit of scrubbing to remove, and naturally due to the acidity, there will be more polish work in my future. Some flock of birds had a heyday from the tree overhanging my driveway. I don't know that it left my paint as though it had just been clay-barred (as some other reviewer said), but it is a bit more aggressive and seems to find a nice compromise between a gentler everyday carwash/shampoo and a product that might be overkill. I would recommend it. This product is great, works very good even when highly dilluted like 8:1, i spray it on lower area of bumper, mirrors, bottom section of doors, removes all bugs, dirt, etc. Really nice because it allows you to clean your car faster, more efficiently and does not cause scratches. Good to have in your arsenal. I have only used it once but I was impressed with how well it worked. I only had some light tar spots on that wash but they came off only a very gentle scrubbing. WOW!! You guys are freaking awesome ! I've heard amazing things about y'all's customer service and it's def true! THANKS! !